The piece 'Oliver Twist Can't Do This' is the evolution from my previous designs using flame or leaf - like spiralling - which is probably inspired by William Hunter's works. I'm fascinated looking through surface voids and viewing the opposite side, enjoying the openness as well as the wood grain of solid surfaces. This popular technique adds an additional feature due to the optical effect of seeing both sides and the ever-changing view as you move your head from side to side. 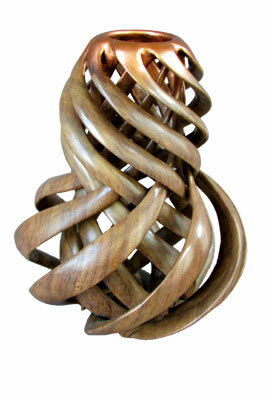 At 2am one morning I awoke with the idea of putting two spiralling pieces together so I could see four surfaces. I nurtured this idea for several months. The simple idea of putting one piece inside another evolved into the more complex interweaving of two pieces. I couldn't quite concept it with visualisation. I wasn't able to sketch it out satisfactorily. Since I have no three-dimensional graphical software on my computer, I was unable to convince myself it was doable. My most practical option was to just do it. After several less than satisfactory attempts I developed several characteristics necessary for a decent vessel. Preplanning and dimensional accuracy is a necessity to get the two pieces to mate properly, especially at the places of intersection. It needs to be at least 180mm high to allow for access of the tools I have. The spaces between spirals must be wide enough for cutting and sanding tool access. A dense wood works much better than coarse grain softwoods for a befitting surface. I used walnut (Juglans regia) for this piece. The finish - I use waterless lacquer - is applied to each piece before 'screwing' them together. Something I didn't anticipate was the resulting conglomeration of void shapes that escaped from the symmetry associated with a single vessel. What's next? I'm looking forward to the next time I awake mid-morning from another nightmare.